Ativan is the brand name of lorazepam, a benzodiazepine commonly prescribed for the treatment of acute anxiety. It is also sometimes used as an anticonvulsant and as a sedative prior to surgery. Due to its potent, sedating effects on the central nervous system, Ativan has a high potential for abuse and addiction. Those using Ativan – especially those who misuse it or take it non-medically – are at risk for developing tolerance and experiencing withdrawal when the drug is suddenly stopped — two factors commonly seen in situations of substance addiction. If you’re unable to stop using Ativan, you can get help. Structured detox treatment programs have staff that understand how to detox off Ativan safely and can help ease your withdrawal symptoms to prevent relapse. Rebound anxiety and insomnia are some of the most common withdrawal symptoms. Rebound insomnia and anxiety typically begin approximately one to four days after the last dose of Ativan is taken. The return of symptoms is only temporary and will typically fade after the withdrawal period is over. Rebound anxiety and insomnia are more likely to occur when a user abruptly stops taking the drug. Distressing symptoms such as these, in combination with the risk of convulsions and seizures, make tapering (or gradually lowering the dose over time), the safest method of getting off Ativan 2,3. What is the Timeline and Protocol for Detox? Acute withdrawal symptoms may begin as soon as the drug starts to leave the body, usually within 10 to 24 hours after the last dose. The detox and withdrawal period is different for each person. Symptoms are usually more severe and last longer in long-term users who took higher doses, as well as those who combined Ativan with alcohol and other drugs — especially barbiturates and opiates. The duration of acute withdrawal typically lasts around 10 to 14 days, but some symptoms can persist past that period for some people. Other more long-lasting benzodiazepines may be used administered to patients as they taper off Ativan. The more long-lasting benzodiazepine used will help to stave off the more symptoms of withdrawal during the taper. After the initial detox plan, treatment professionals will assist patients in developing and maintaining a long-term treatment plan to maintain sobriety 5,6,7,8. Failed attempts to stop taking Ativan. Increased tolerance (requiring more of the drug to achieve the same effect). Feeling unable to function normally without Ativan. Withdrawal symptoms when use is reduced or stopped. Continued use despite negative impacts on personal, professional, and family life. Those with mood, sleep, and anxiety disorders are more likely to become addicted to Ativan. Pre-existing depression may recur or worsen during Ativan use, during acute withdrawal, and potentially during protracted (extending past the acute period) withdrawal 3. While it is rare, it is important for recovering addicts to understand the risk of self-harm during benzodiazepine withdrawal. Case studies reported by The British Journal of General Practice have indicated that self-harm and suicidal behaviors may be associated with the psychological effects of benzodiazepine acute and protracted withdrawal 4. Attempting to quit Ativan on your own can be both physically and psychologically dangerous. Due to the severity of withdrawal symptoms and the risk of relapse, those with an Ativan dependence are advised not to attempt to quit on their own, but to instead participate in a medically supervised detox program. During a supervised detox, Ativan users will lower their dosage slowly in order to minimize withdrawal symptoms and increase comfort. Psychotherapists and counselors can also help address any mental health issues that may arise during the withdrawal period 3,6,7,8. Where Can I Find a Detox Program? Inpatient programs are appropriate for people who have a severe Ativan addiction, medical conditions, psychological issues, or who have co-occurring addictions to other substances. The round-the-clock supervision and intensive treatment provided in an inpatient setting is typically more appropriate for the management of these cases. Outpatient programs can be an appropriate choice for those who have been cleared by a medical professional and have little to no risk of a complicated withdrawal. Outpatient programs tend to be lower-cost, more available, and allow people to work and tend to their families. A person needs to be highly committed to detox and have a relatively low-stress environment at home, as well as have transportation to attend several times per week. Doctor’s offices can provide management of Ativan withdrawal in certain circumstances. A doctor may be able to perform an appropriate taper from Ativan and, if needed, supplement the withdrawal with other medications to ease the symptoms of Ativan withdrawal. However, many people find that they prefer the added social support provided by inpatient or outpatient detox programs. A doctor’s office is appropriate for people who have a relatively mild physical dependence on Ativan and no co-occurring disorders. What Medications are Used for Managing Withdrawal? Gradual reduction can help to prevent the emergence of severe withdrawal symptoms. Typically, patients will be put on a tapering schedule in which the dose of Ativan is gradually decreased over a set period of time. This gradual reduction can help to prevent the emergence of severe withdrawal symptoms. Medical professionals may switch Ativan with a long-acting benzodiazepine, such as chlordiazepoxide and clonazepam 9. Furthermore, in certain cases a physician may administer sedating antidepressants, such as trazodone, or anticonvulsants, such as carbamazepine. There is some evidence that these agents are beneficial in treating the mild subjective symptoms of withdrawal but they don’t tend to reduce severe symptoms 4. Individual counseling/psychotherapy: Counseling and psychotherapy can help an individual in recovery address the psychological aspects of his or her addiction. People often begin using Ativan as a means of controlling symptoms of anxiety. When use is stopped, rebound anxiety may occur. Psychotherapists can teach cognitive behavioral techniques that can help relieve anxiety without the use of drugs. Counseling can also help recovering users cope with any underlying issues that may be perpetuating their substance use. Group therapy and/or family counseling: Group therapy and family counseling are an important part of addiction treatment. Group therapy allows patients to process emotions, cope with cravings, and adjust to sober life with the support of others who can empathize with their situation. Family counseling is also important as it allows addicted individuals and their families to cope with addiction, learn how to maintain sobriety, and address any relationship problems associated with the addiction. 12-step programs/support groups: 12-step programs provide recovering users with a step-by-step process for achieving sobriety in a supportive and structured environment. Aftercare/relapse prevention: Aftercare is a crucial part of the treatment process, as it helps maintain sobriety over time. Aftercare helps prevent relapse by helping a recovering addict cope with stressors that may trigger the desire to use. Aftercare typically consists of counseling, ongoing support groups, access to a sponsor (a sober person who is further along in recovery), sober living communities, and outpatient visits. 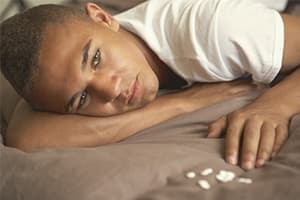 Aftercare is especially important with Ativan addiction as the protracted psychological symptoms of withdrawal can often lead the individual to believe he or she cannot feel psychologically well without the drug, which often leads to relapse. Treatment is typically available on both an inpatient and outpatient basis. Inpatient treatment provides care 24 hours a day, seven days a week for a designated period of time, typically ranging from 30-90 days. This intensive round-the-clock treatment regimen provides those in addiction recovery a supportive and stable recovery environment free from outside stressors and triggers. Outpatient treatment programs typically consist of the same treatment approaches as inpatient facilities, but they take place on a part-time basis. Outpatient treatment allows patients to remain active in their day-to-day lives and maintain any work and school duties they may have. While both treatment regimens are effective, inpatient rehab may be the preferred choice for those with severe and/or recurring addictions 8. Drug Enforcement Agency. (January 2013). Benzodiazepines. U.S. National Library of Medicine. (October 1, 2010). Lorazepam. Food and Drug Administration. (March 2007). Ativan: Medication Guide. Neale, G. & Smith. A. (May 1, 2007). Self-harm and suicide associated with benzodiazepine usage. The British Journal of General Practice: 57(538): 407-408. Semel Institute: UCLA Dual Diagnosis Program. Post-Acute Withdrawal Syndrome (PAWS). Semel Institute: UCLA Dual Diagnosis Program. Benzodiazepine Addiction: Treatment for Valium, Xanax, and Other Benzodiazepine Addiction. Food and Drug Administration. (2016). Ativan C-IV (lorazepam) Tablets, Rx Only.